There are times when I want to escape the noise of the city and ignore the corruptions of the 21st century. When a contemplative mood strikes and my inner Confucius rears its head, I head straight to Comptoir Florian. 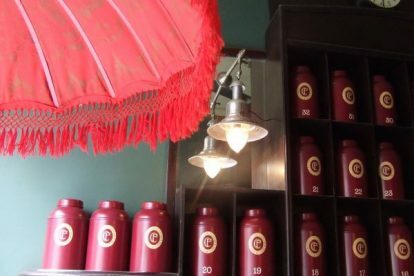 Housed in a beautifully restored art-nouveau townhouse, the tea shop at the front hides a miniature tea salon, with an incredible range of weird and wonderful teas, from white to green, and everything in between. I always try to get a table in the back room, where one of the comfortable armchairs is the perfect place to read. The main space is equally relaxing, though, with a colonial allure that evokes bygone centuries of trade winds, tea clippers and opium dens. Tea is taken seriously here and once you’ve tasted it you’ll understand why. What you get is worlds away from the usual bag in boiling water fare. Instead, loose leaves are slowly brewed in filtered water, to give the taste that so delighted Chinese emperor Shennong when he accidentally discovered the beverage way back in 2737 BC. I don’t go there if I feel like a frenetic gathering of friends, or if I just need a quick drink. But, if I have some time to read or I want a pleasant conversation with a good friend, in hushed tones naturally, this is the place I choose. I can even be sure that nothing will disturb my serenity: a sign on the door reminds customers to switch off their mobile phones!